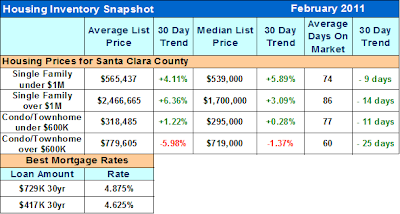 Nathan's Real Estate Notions: Secret Property & Market Update: Is Housing Recovery Underway? Secret Property & Market Update: Is Housing Recovery Underway? SECRET HIGH END PROPERTY! NOT ON THE MLS YET! This home has not yet hit the MLS and as one of the benefits of being in my database I make sure that you get the first chance to see it. Let me know if you would like to see it. 647 Rocking Horse Ct in San Jose, priced at $995,000. Available through the public MLS in a few weeks. Custom built home in the foothills with views of the valley. Large rooms and a large rectangular lot with RV parking and many fruit trees. Call me today before it hits the MLS 408-209-9556 to arrange for a private showing. For Comparison: Sales picked way up on the west side of Highway 880 during the holiday months, but now it is starting to slow down a bit. We will know much more about the direction of the housing market in the coming month.